I LOVE it when we finally get to meet our brides in person after we have been Instagram friends for quite a while. Victoria has always made me laugh on Instagram with how funny and candid she is with Bradley. They are equal parts loving, goofy, happy, caring, and gorgeous! Fall is my favorite time of year at Jefferson Patterson Park, so I was super excited when Brad & Victoria said that they wanted to do their beachy fall engagement session here! Bradley and Victoria have been enjoying their engagement – he proposed back in December 9, 2017! 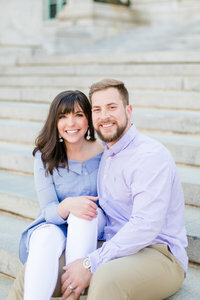 He had coordinated an evening out in DC with their closest friends, going out for drinks and visiting the National Christmas Tree, where he got down on one knee! Afterwards, they went out with all of their friends to the Christmas PopUp Bar to celebrate! This time next year, they will be married for more than a MONTH! We can’t wait for this day. How cute are they? !